Preserved Firefly, showing its camouflaged barrel, as seen in 2008. This legendary piece of ordnance was the first of the many ROF (Royal Ordnance Factory) cannons which came to fame postwar. These included the rifled L7 105 mm (4.13 in) and later the L11 120 mm (4.72 in) gun that was given to the Chieftain and Challenger. The 17 pounder was a 76.2 mm (3 in) gun with a length of 55 calibres. It had a 2,900 ft/s (880 m/s) muzzle velocity with HE and HEAT rounds and 3,950 ft/s (1,200 m/s) with APDS or Armor Piercing Capped, and Ballistic Capped. These figures allowed it to defeat armor in the range of 120-208 mm (4.72-8.18 in) in thickness at 1,000 m and up to 1,500 m with the APDS. The design of the gun was ready in 1941 and production started in 1942. It proved itself time and again in Tunisia, Sicily and Italy, with the first action in February 1943. So the idea to have it inside a tank turret was a priority, since the QF 6-pdr was found inadequate by 1943. However, the 17 pounder was long and heavy. It therefore needed much reworking and compromises to have it installed in a turret, and intermediary solutions had to be found. By 1944, the Archer used it, as well as the Achilles (M10 Wolverine), the Challenger, and later the Comet. The work of genius was that of successfully cramming the heavy gun into a turret it was never designed for. By doing it, W.G.K. Kilbourn, a Vickers engineer, allowed the quick conversion of the most prolific Allied tank. This ensured that no changes in maintenance, supply and transport chains were needed. These were quite critical factors after D-Day. There were a few changes made to the chassis, most of which were Mk.I hybrids (cast glacis) and Mark Vs, except for the modified ammo cradles and the hull gunner position being eliminated to make room for more ammo. The turret interior was also completely modified. The rear was emptied to allow the gun to recoil and a counterweight was added to the rear to balance the long barrel. This “bustle” now housed the radio, formerly at the back of the turret, and could be accessed by a large hole in the casting. The mantlet was also modified, 13 mm (0.51 in) thicker than the original. The loader also had his position changed. A new hatch had to be cut into the top of the turret over the gunner’s position since the size of the new gun prevented the gunner from using the normal hatch. But the 17-pdr itself still had a one-meter long recoil course, and the whole recoil system was completely modified. The main recoil cylinders were shortened while additional new cylinders were added to take advantage of the turret width. The gun breech was rotated 90 degrees to allow the loader to sit on the left. The gun cradle also had to be shortened, which caused stability concerns. These were solved by the adoption of a longer untapered section at the base of the barrel. Therefore, the Firefly had it’s custom tailored version of the 17 pdr. Official British War Department test figures show that the 17pdr anti-tank gun firing armor piercing AP rounds would penetrate the following thickness of homogeneous armour plate and these distances: 500 yrds. (457 m) = 119.2 mm; 1000 yrds (914.4 m) = 107.3 mm and 1500 yrds (1371.6 M) = 96.7mm. When firing armor-piercing capped (APC) rounds at face-hardened armor plate these are the test results: 500 yrds. (457 m) = 132.9 mm; 1000 yrds (914.4 m) = 116.5 mm and 1500 yrds (1371.6 M) = 101.7 mm. When fired at sloped armour it was estimated there would have been 80% success at 30 degrees’ angle of attack. The Firefly was ready in numbers and filled the 21st Army Group’s Armored Brigades in 1944, just in time for D-Day. 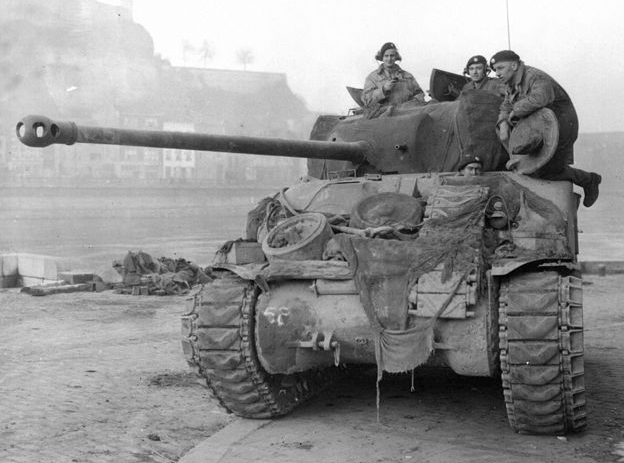 This was fortunate because Allied intelligence did not anticipate the presence of enemy tanks, of which the numerous Panthers were formidable adversaries for the Sherman. 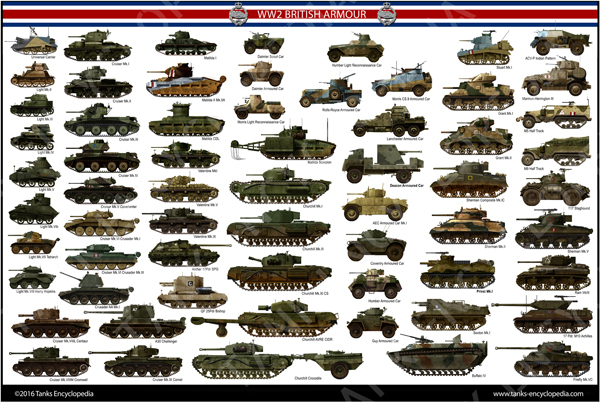 Their effectiveness rapidly became legendary, as testified by the most enviable hunting scores of all Allied tanks. On 9 June 1944, Lt. G. K. Henry’s Firefly knocked-out five Panthers from the 12th SS Panzer Division in rapid succession during the defense of Norrey-en-Bessin. Other Shermans were credited with two more, out of a total of 12, successfully repelling the attack. On June 14, Sgt. 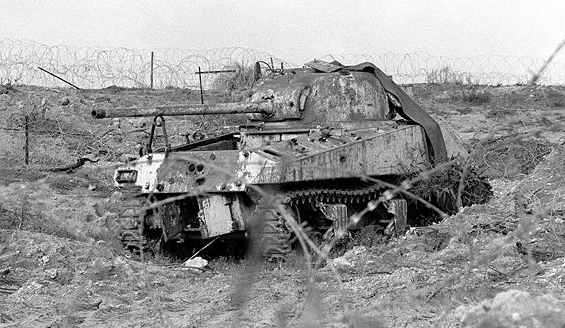 Harris of the 4th/7th Dragoon Guards destroyed five Panthers around the hamlet of Lingèvres, near Tilly-sur-Seulles, changing position in between. Even the most feared German top ace tank commander, Michael Wittman, was presumably killed by a Canadian Firefly. 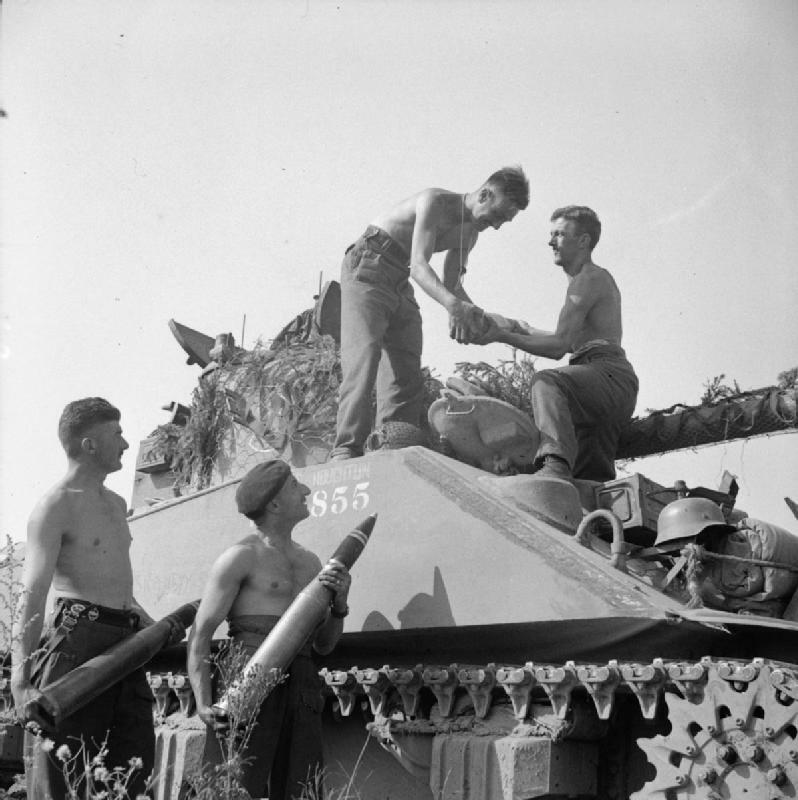 This famous action was credited to Ekins, the gunner of Sergeant Gordon’s Sherman Firefly from the 1st Northamptonshire Yeomanry, A-Sqn. He destroyed three Tigers in a row, one of which was presumably that of Michael Wittman, near Cintheaux, in August 1944. Firefly Ic hybrid from a Polish armored unit, Italy 1944. Firefly Ic, 29 Armoured Brigade, 11th Armoured Division, Normandy, summer 1944. 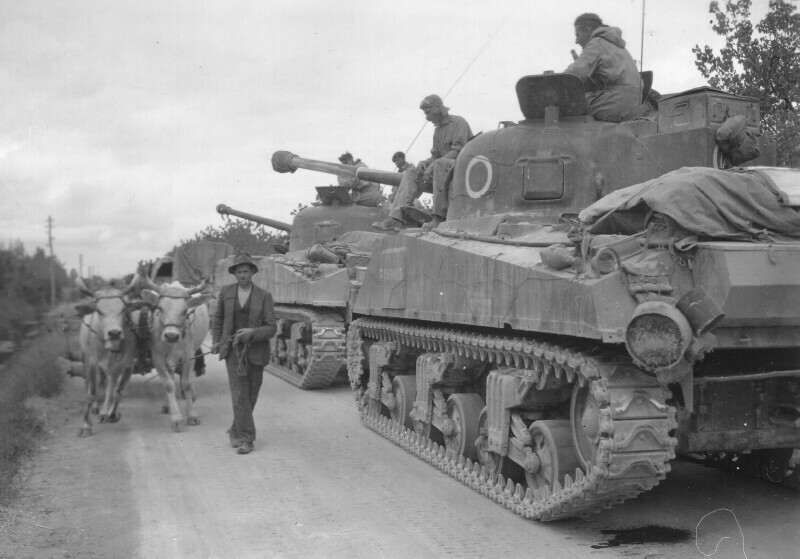 Firefly, VC 3rd County of London Yeomanry, 4th Armoured Brigade, Normandy, summer 1944. 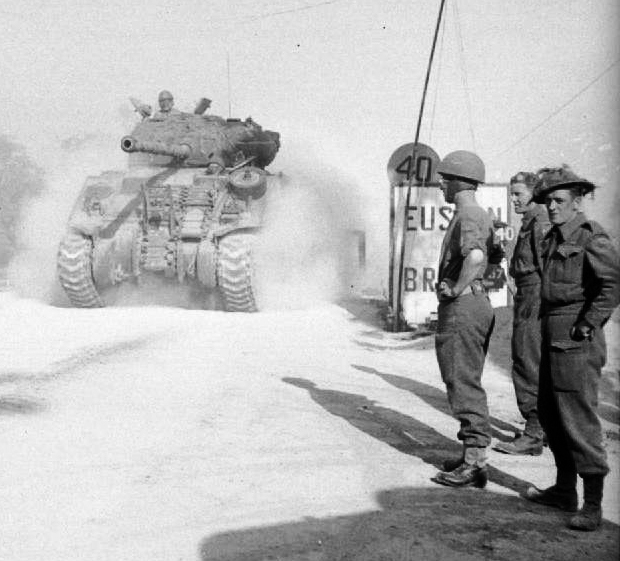 Firefly VC, 4/7th Royal Dragoon Guards, 3th Armoured Brigade, France, 1944. Firefly Mk.VC “Dopo voi”, New Zealand 15th Armoured Regiment, 4th Armoured Brigade, Trieste, Italy, May 1945. New Zealander Firefly VC “Peacemaker”, 15th Armoured Regiment, 4th Armoured Brigade, Adriatic front, Italy, 1945. Rare Mk.Ic composite Firefly Tulip, the ultimate tank hunter. It was given RP-3 rockets also used by the Hawker Typhoon. what the difference between firefly VC and IC? 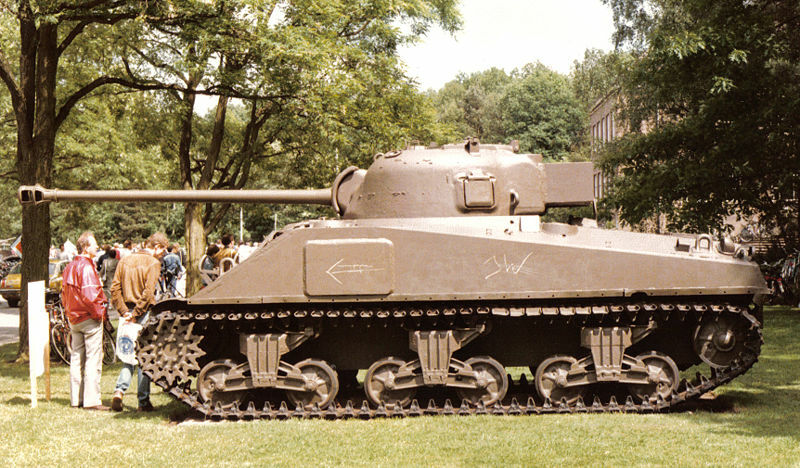 The Firefly IC was based on the Sherman I (M4), while the VC was based on the Sherman V (M4A4). And for the HEAT fix, I think HEAT was merely tested for the gun. British never issued HEAT however I think that the shell type was used in testing. HEAT shells and rifled barrels do not work together very well. And the British have always liked rifled barrels. Does anyone have information regarding Post Second World War Sherman Fireflies? 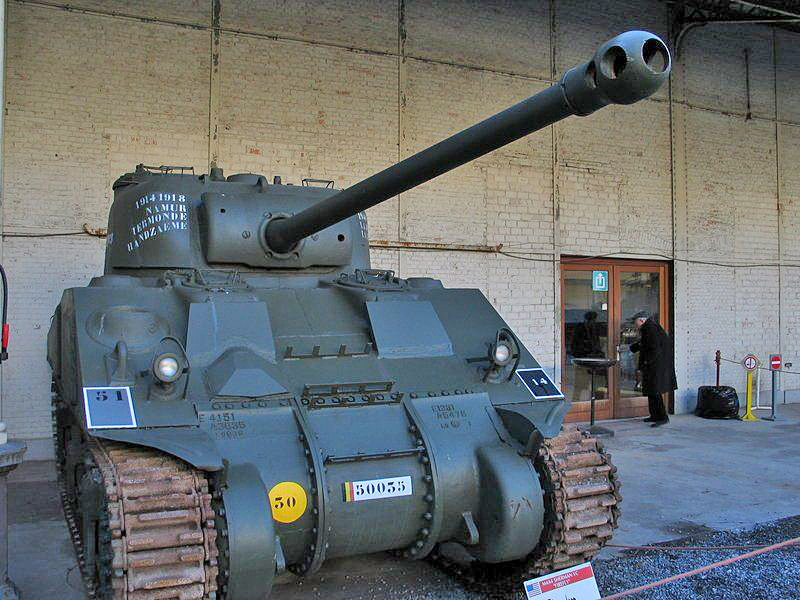 I’ve come across the “Sherman Repotenciado” from Argentina, but I am not having much luck. is there evidence that the Sherman Firefly used APDS rounds during WWII due to their initially poor accuracy and missing optics? Did any American tank division use a Firefly? No, they were not too keen on the 17-Pounder. The American’s favored the 76mm once it became available. But isn’t the 17pdr more powerful than the 76mm? At first yes, but ammunition for the 76mm was produced which granted it similar balsamic abilities. balsamic refers to vinegar lol, you probably meant ballistic. now 76mm vs 17 pdr. Hi, I noticed you made a little area in the second paragraph of the first sub heading, where you said “However, the British Army had just received the superlative 17 pounder, which proved itself able to nail any known Panzer.” The 17 pounder was actually first used during the North African Italian Campaign in early 1943, so by the time the Sherman was being tested with the 17 pounder, the capability of the weapon was known. Just a little comment for an extremely minor problem (I am sure you are working on other things – like a Jagdtiger article :). Why didn’t the Americans use the Firefly? 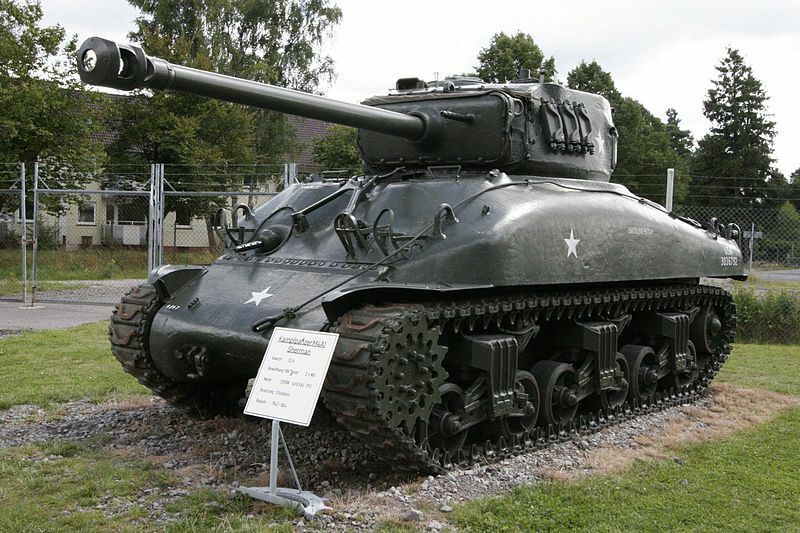 There were a number of reasons, but the the most relevant one was that the Americans were more satisfied with their preexisting 76mm gun on a Sherman than the 17 Pdr. The 17 Pdr is a large gun and didn’t fit into the Sherman turret well (hence the extra hatch needed for the loader) and the ammunition stowage was a problem, the gun in the firefly was notoriously tricky to load in a hurry and the loader only had a few rounds readily available before they had to replenish from the ammo stowed in the hull, which required traversing the turret around and wasn’t really something you could do when you were being shot at. The 76mm on the other hand offered more space to work the gun and stow ammunition. Thomas, please see below Taken from U.K. national archives Catalogue Reference:WO/229/83. 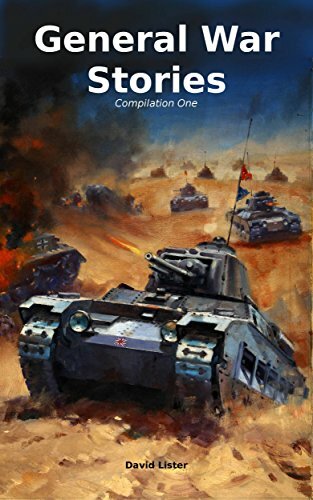 It may be of more interest to the encyclopaedia because it covers SHAEF headquarter reports, logistics, tank status 1944/45. You are quite correct,but without the updated ammunition, the 76mm could not defeat the Panthers front armour, never mind the Tiger. The documents cover the exchange between Eisenhower and ordnance, not helped when ordnance’s view was problems what problems. So he tested to find the British guns worked and none of the American guns didn’t, he was particularly chastened as the 6 pounder with APDS, was very successful. This resulted in the letter to Marshall urgently demanding improvements. However, by the time the M36 arrived, ordnance’s answer, the battle was over. There apparently is evidence, got to get the detail, that the war department suppressed reports from Italy that there were serious problems fighting Panther. Bottom line, the British realised they needed a better gun on the Allied tanks, and shoehorned it into the Sherman and Cromwell ( to become Challenge,) the old half a loaf is better than none. Ordnance wanted a fully working tank, ie Pershing. This delay was unfortunate for the US Army Armoured Divisions. Doctrine, ignorance and ego of one man played a huge factor in Americans not up gunning the Sherman. General Lesley McNair dictated U.S. Armor Doctrine and policy at the time and his Tank Destroyer Doctrine took president. McNair felt that the 75mm was ‘good enough’ as it had handled the Panzer Mk III and Mk IV F1 (Short Barrel 75mm Cannon) in North Africa, so he felt additional heavier tank guns were not required and McNair “did not want to tie up the long supply line from America” with additional equipment like new ammunition or a new tank which delayed improvements to the Sherman and development of the Pershing. While they had encountered limited number of Tiger tanks in North Africa the US seriously underestimated their numbers in Europe and had not encountered a Panther on the battlefield yet. McNair delayed upgrades to the Sherman as well as development of the Pershing and both statistics and Reports show that the Tank Destroyers were seldom employed as intended for the simple reason as Heinz Guderian said you fight tanks with tanks. It was also US policy at the time to not use or rely on foreign manufacture of any ordinance for strategic reasons. Floyd, an excellent summary, have you seen Eisenhower’s letter, after he finds out about the M10 76mm not able to destroy a Panther head on, 2 July 1944. He then initiated tests with all allied guns against Panther hulls, to find only the 6pounder APDS and 17 pounder could destroy them in the test. He was far from happy, the exchange with ordnance resulting in him sending a brigadier with a personal letter to Marshall. Only when the m36 arrived in September 1944, he had the 90mm gun. It all starts again after the Battle of the Bulge, your point tanks after fight tanks and they sent some Pershings, by then it is about over. Even the most feared German top ace tank commander, Michael Wittman, was presumably killed by a Canadian Firefly. 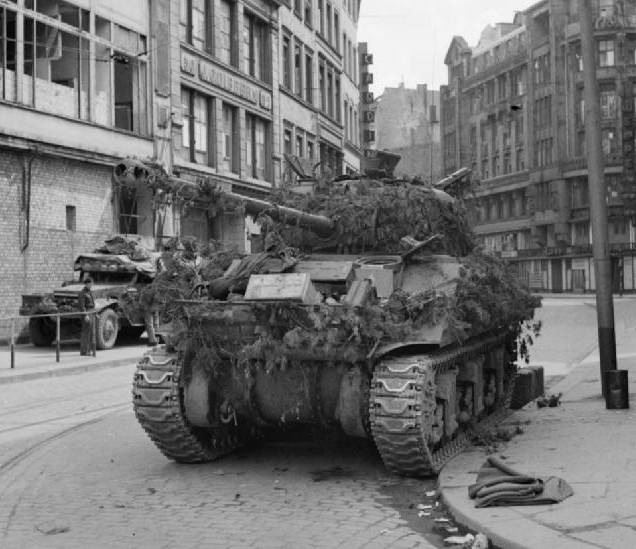 This famous action was credited to Ekins, the gunner of Sergeant Gordon’s Sherman Firefly from the Sherbrooke Fusiliers Regiment, A-Sqn. He destroyed three Tigers in a row, one of which was presumably that of Michael Wittman, near Cintheaux, in August 1944. This is not correct. Please change. 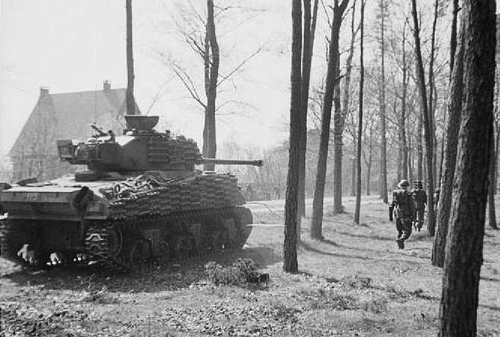 Sergeant Gordon’s Firefly was the Northamptonshire Yeomanry which destroyed 3 Tigers of the 8 Tigers involved. A further 2 Tigers were also destroyed, during the engagement. So a total of 5 of the 8, the Northamptonshire Yeomanry claim all 5. However, the debate has been about Wittman, and whether it was The Sherbrooke with standard Sherman’s firing from the left flanks or the Firefly also firing but from the opposite flank. The argument being the Firefly was too far away. 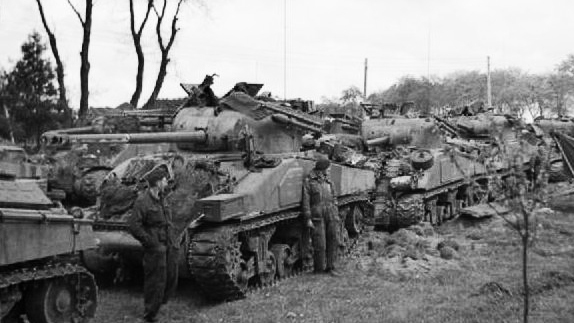 Analysis at the time, now released on the commonwealth tank performance during Normandy is quoting an average engagement distance of 1120 yards for the Firefly and Challenger so the Northamptonshire Firefly could have comfortably engaged the 007 Tiger. The penetration performance of the 17 pounder round against the 75 mm standard round, logically would point to the Firefly, however the debate will continue. Did the Firefly ever get to fight in the desert? (I use one for my Commonwealth forces in Bolt Action, and have a desert painted one. It annoys the hell out of some people, who claim it never fought in a desert. It would be fun to be able to point to a Firefly in desert scheme…. No, the Firefly entered service faaaar too late for the war in North Africa. I stumbled across a few typos in this article. In the first sentence under the header “Conversion design”, change “succeeding” to either “successfully” or “succeeding in”. Another in the last sentence under the header “Main Gun penetration figures”. Change the word “slopped” to “sloped”.